Friendship: A magic phenomenon that usually occurs exclusively between a handful of people. 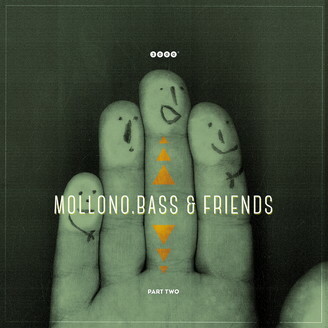 However, in the case of Mollono.Bass & Friends this unique feeling of being connected with each other finds expression through the language of rhythm and sound - that’s why it is highly contagious, because everybody in front of the speakers is quite literally in tune with anybody else. Real friendship is profound and based on many factors, a principle that finds expression in the title “Friendship”. Organic electronics, trombone, violin, guitar and vocals complement each other and create an uplifting feeling of catchiness that is clearly reminiscent of a hymn. “One World, Our Future” is bursting with pressure and sublime psychedelic elements, the title “Darkness” is a mesmerizing story that takes place in the mysterious twilight between a golden sunrise and a thunderstorm of bass. Last but not least there's “Out Of Train”, a track that is dubby and dope as it can be, yet based on a sturdy dance floor groove.